Let’s face it, in some industries, it’s almost impossible to keep a clean workspace all of the time. We want to make it easier for you with our dust proof cabinet. If you’re working in an industrial space where there’s a lot of dust, this is the ideal storage solution for you. Our Dust Proof Cabinet is perfect for heavy industry and dusty workplaces. 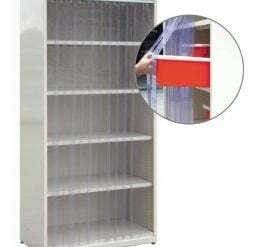 The clear strip door over the cabinet provides quick, easy access and dust control, making it a great storage solution. If you’re wanting a clean, easy to access storage option, we’re here to help!